Those among us who do both flying and ham radio have a dilemma: as a pilot we usually own a high grade aviation noise canceling headset that is generally of better quality than most headsets available in the ham radio market (I personally own a David Clark H10-13.4 headset … try to find a passive headset with similar robustness). However, all standards regarding plugs etc. are different and it looks like there is no commercial solution available to interface your aviation type headset with your ham radio gear – at least to the best of my knowledge. So, in the best tradition of ham spirit, I decided to build an interface. Since I still use my headset for flying cutting off the plugs and replacing them with ham plugs wasn’t an option. First problem: where do you find the correct female connector? The phone part of a civil fixed wing aviation headset (caution: different standards for military, helicopter, and commercial airliner!) uses the standard 6,3mm headphone plug equivalent to your stereo headphone. The microphone, however, uses a 5,6 mm three pole plug. No chance to get them at your local electronics dealer. Fortunately there are a couple of aviation specialty mail oder stores than can help you out … for instance Friebe, Siebert, Büscher in Germany, or Aircraft Spruce in the US). Plugs for the FT-897 are simple. Headphone plug is a standard 6,3mm phone jack (you can actually plug the Aviation Headset right in if you want to), the mic jack is a standard RJ-45 jack. Since I didn’t want to buy the necessary crimping equipment I just used a surplus network cable. 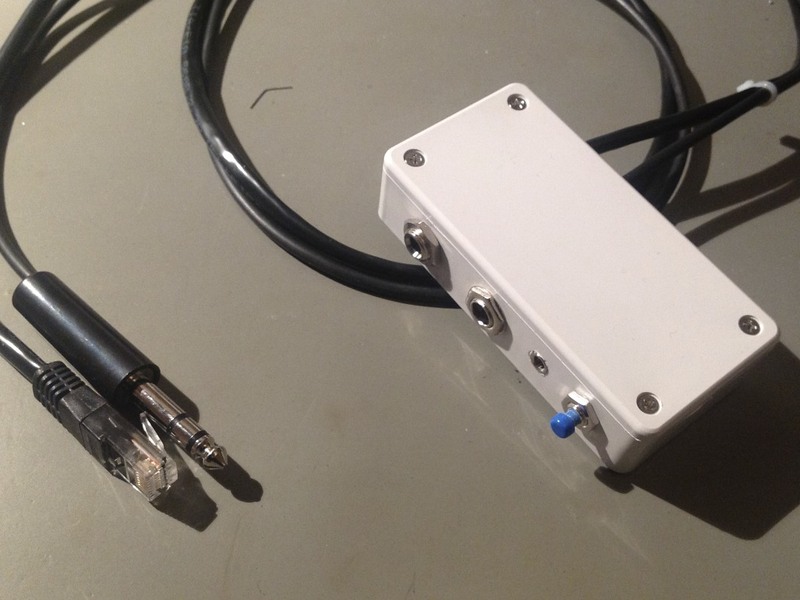 The interface is built in a small box containing the receiving sockets for the aviation headset, the cables to be connected to the transceiver (phone and mic, both ca. 1,5m long), a push-to-talk switch (PTT), and a jack to connect an additional external PTT switch. This way the interface box is very conveniently located in the middle between the headset and the transceiver which gives you additional room to move and enables you to overate the PTT switch holding the interface box in your hand. The following picture shows the overall configuration. 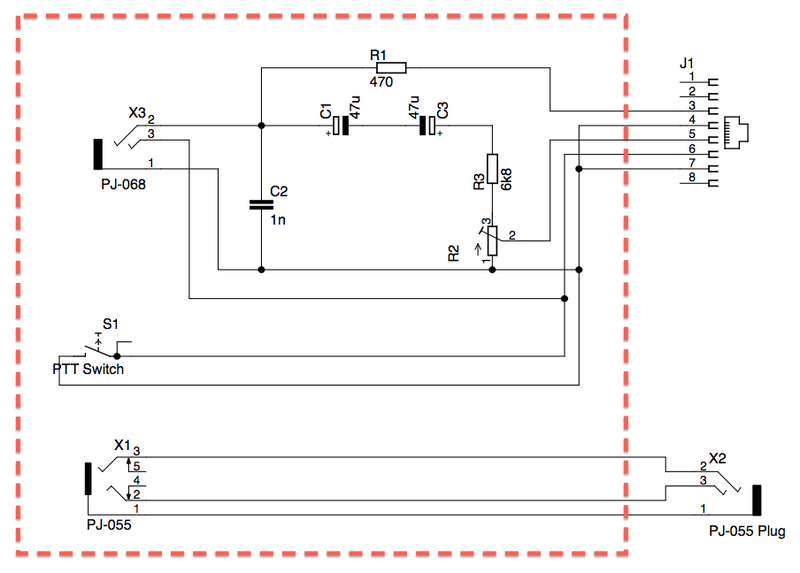 The circuit itself is simple and requires only a few standard parts to provide the microphone with the necessary power and to adjust the microphone output level. Pin 3 provides via the 470 Ohm resistor the necessary power for the mic, the two 47uF capacitors remove the dc component for the audio input to pin 5. The 1k poti / 6k8 Ohm combination allows for the necessary output level adjustment. A 1nF capacitor removes any HF components that might end up in the system. I decided to include the pin 3 (tip connector) of the headset mic plug that is used in aviation systems as PTT switch. That enables me to use other aviation mics (e.g., handheld mics) with the same interface. Since the aviation standard does not provide a different ground for PTT and MIC I had to connect pins 4 and 7 at the Yaesu Mic connector. As you see, all components fit comfortably in a 100x50x25 mm box. Before closing the box adjust the microphone output level using the built in ALC meter in the FT-897. Fine tuning can be accomplished with the “SSB Mic Gain” menu in the FT-897 settings (menu no. 81). My experiences with the configuration are extremely positive so far. My David Clark headset provides excellent noise cancellation abilities and the noise suppressing microphone works very nicely with my Yaesu rig. Any further comments and tips are highly welcome. 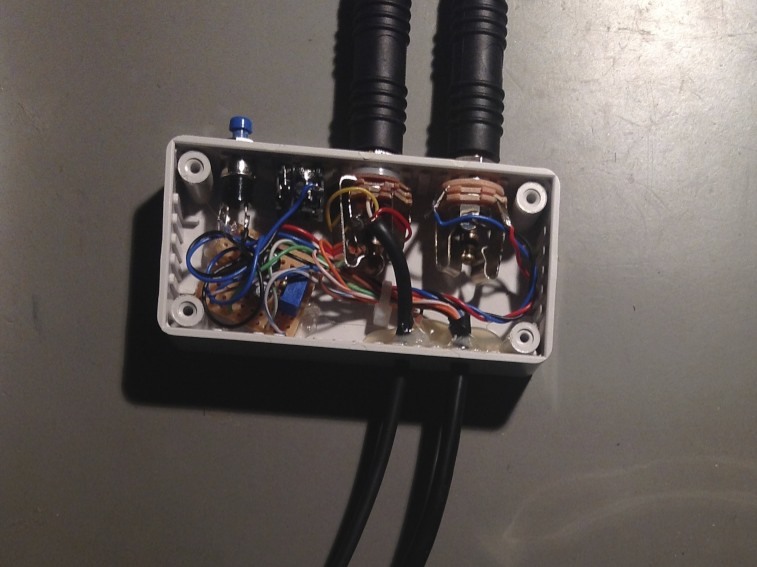 This entry was posted in Ham Radio and tagged David Clark, Equipment, Ham Radio, Headset, Homebuild, Interface by Jens U. Moeller. Bookmark the permalink. Can I have you email address? I need your help, if you can, for military headset w/microphonedynamic M-87/AIC. I would like to send you the pictures of my headset to understand if your circuit can help me to give power at that mic. I use a TS -2000 or TS-440. I just sent you an eMail so you can provide me with a picture of your headset. Let’s see what what we can do. I have a question with this circuit adapter. 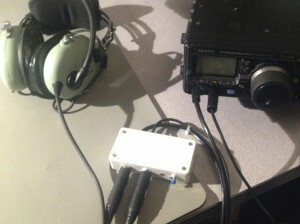 Have a Flightcom 40LX Headset + FT-897D . In FM the modulation is correct but in HF it´s impossible a lot of gain and noises. Hi, I would assume that you have to modify, i.e. lower, the NF level going to the transceiver. If the range of the trimmer doesn’t work you might want to change the resistor in line with the trimmer. I have a TS2000 like Alessandro with an aircraft headset. Did you found a solution ? Hi Thierry, unfortunately not. Can you describe your problems in greater detail? I have the same transceiver than Alexandro. I try to create your solution but it doesn’t works correctly. Did you found a solution for Alexandro? Da ich einen ähnlichen Umbau für meinen IC 7200 und ein TELEX airman 750 beabsichtige, würde ich mich freuen, wenn ich Ihnen einige entsprechenden Fragen stellen dürfte. Das Airman 750 besitzt bereits einen eingebauten SMD-Verstärker, dessen Schaltung mir vorliegt. Dennoch sind mir dort zwei Dinge nicht ganz klar. da bin ich wahrscheinlich auch überfragt. Meine Vermutung wäre allerdings, dass die Schaltung mit anderen Headsets ähnlich funktionieren müsste. Schließlich lassen sich die Headsets alle in Luftfahrzeugen der General Aviation problemlos betreiben. Do you know if there is any difference with the plug port for the Yaesu and a Kenwood TM-281a? The specific setup that I would like to use is the Kenwood and the ASA HS-1A headset. Your assistance would be much appreciated. Sorry, unfortunately I have absolutely no information on the Kenwood product line. If you find something, feel free to post your insights here for the benefit of the community. Thanks for posting this circuit. I do have one question. Not sure what a 6k8 resistor is. Is that a 6.8 k ohm? PS. Just had my H10-40 rebuilt at David Clark and they did an incredible job. It’s at least 30 years old, and it now looks and works brand new! Yes, you are correct. 6k8 means 6.8 kiloOhms. Great news on your refurbished DC headset, I didn’t know they offer this service. I upgraded to a Bose A20 last December. I thought it might make sense to protect my hearing a little bit better since I got my flight instructor rating last year and started to log about 100h+ annually. I have to say, the difference is remarkable. Thanks for this great information. Quick question. If I have a radio that provides a bias voltage of 8 volts rather than the 5 volts from the FT-897, how would you modify the circuit? Would you just change R1 from a 470 ohm resistor up and change C1 and C3 as well or would you merely change R1 to reduce further? Hey Bill, I haven’t thought about this yet. But given the unexpected resonance on this blog entry I’ll look into it. What would be required to power this with a 9 volt battery? While I have a Yaesu radio, I’d like to make this unit compatible with any radio (Kenwood radios do not provide a DC Bias voltage best of my knowledge) . Would the positive end of the battery go into the 470 Ohm resistor? Would about the negative end of the battery? Would this be connected to the ground of the radio? I plan to make different interface cables with ethernet on one end and the appropriate pin connector on the other. 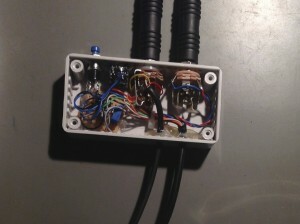 I use (the principle of) this circuit for the UFM A100T. This is the microphone extension for the Bose QC15, making it an ANR headset. C’s changed to one 22uF capacitor. Output : only a fixed 1K resistor. All components fit inside a 8 pole microphone connector, which replaces the 5 mm jack plug. What if your rig doesn’t use a modular Mic jack. How would this change the circuit ? Hmmm … not sure. Depends on where the phantom power is supplied and how the PTT works. Do you have specs available? This is exactly what I have been looking for. Thank you so much. I am looking forward to constructing this and seeing how it goes. Thanks! Let me know how it works! Don’t know and unfortunately I don’t have the means (access to radio) to test it … let me know if you find out more. But in general, you have to look for two things: (1) Does the radio provide the necessary phantom power for the mic (2) how is the PTT function controlled (the newer Yaesu radios ground the mic line through a 10k resistor). Other than that the circuit should be pretty robust. i would like to know if my sennheiser headset hme-100 can connect with ft897 using your diagram.would appreciate if u can email me with detail diagram so i can build up my own.i cant find any 5.35mm in any elect store. The HME-100 should work fine with the circuit. Finding the 5.35 mm socket can be a little bit of a hassle. You probably have to go to an aviation supply store. Try http://www.aircraftspruce.com for example. Another option would be to visit the next general aviation airport in your vicinity and locate the avionics maintenance shop. They will probably have some on stock. Sorry, I am not familiar with ICOM radios. We are starting a aviation unit here at our local sheriff’s office. We have installed a Motorolia PM400. My thought since we can not find a headset the will plug into the PM400 wanted to see if you would consider building a adapter box. My thoughts was to have someone add extra set plugs from headset with PTT switch on one ear cuffs to transmit the PM400. So in general they will be 2 sets aviation plugs in. One going to the aircraft’s intercom for aviation side, other set plugs going to the PM400 to transmit to other ground units. Sorry for my late reply … I think when it comes to fixed istallations in aircraft you should probably contact your local avionics shop and ask them for advice. My preferred way would be to connect the radio to the audio panel and have it fully integrated in your avionics stack. If you have something like a Garmin GMA 340 installed you can connect up to transceivers. Let me know how you solve the problem. What’s the rating on R2 rheostat ? 100 ohms ? 1000 ?? 1000 Ohms, it’s mentioned in the text but I forgot to label it correctly in the schematics … sorry! Thank you co much for this!! I built the box based on your specs, but have a problem. This is the first time I’ve tried to build a project like this or solder a proto board, so I’m very new to this. I have a lightspeed headset. On 2m (FM), the reports are excellent. However on SSB on 20 or 40m it sounds horrible. Any ideas what the problem might be? ich möchte mir Deine Adapterbox nachbauen. Jetzt bin ich gerade mit der Bestellung der Bauteile beschäftigt. Da ich bisher in der Auslegung der Bauteile überhaupt keine Erfahrung habe, bin ich mir unsicher über die Details der einzelnen Bauteile. So z.B. bei dem Poti. Wie hoch muss es belastbar sein? Die Widerstände: Welche Toleranzen dürfen sie aufweisen und auch hier die Frage nach der Belastbarkeit…. Könntest Du hier bitte kurz Hilfestellung geben?